Is a Low Fat Diet Plan the Best Bodybuilding Diet for YOU? Home > Blog > Nutrition > Is a Low Fat Diet Plan the Best Bodybuilding Diet for You? Are low fat diet plans for you? It’s imperative that you stick to a realistic and effective diet if you’re serious about fitness. Low fat, no carb or a little bit of everything – find what works for you. Well, officially a diet is considered low fat if your daily calories from fat are less than 30% of your total calorie intake. More specifically, the government’s recommendation implies that your diet becomes increasingly unhealthy the further you decrease the fat intake below 30%. It doesn’t consider us weight lifters or athletes! Percentages for diets only work well when they are used for the “average” diet. In other words, they work well when you’re talking about someone who only requires the government-recommended 2000 calories/day, and who doesn’t need extra protein for muscle building and strength training. Check out Lyle McDonald’s article for a more in-depth understanding of the problems with relying on diet percentages. Unfortunately, dietary fat needs don’t correlate to bodyweight the way protein requirements do (i.e. 1.0-1.5 g/lb works for protein, but there’s no equation for dietary fat). So, if we’re going to use percentages to describe the dietary fat requirements in a diet plan, then it’s crucial to understand that the higher your protein and caloric needs are from norm, the less relevant the percentage guideline is. 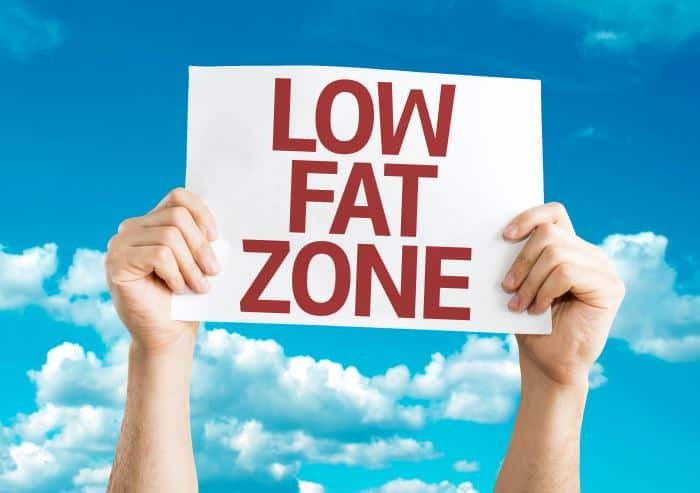 Due to the nature of this site, and the high protein (and usually high calorie) diet required for weight trainees and athletes, I’m going to make the unofficial distinction that instead of below 30% being considered low fat, 20% will be considered low fat, for our purposes. That being said, lower than 20% can still be in the right circumstances (I’ll give an example down the page). Is a Low Fat Diet Plan Right For You? Is a Low Fat Diet Plan Really a Good Idea for You? What If a Low Fat Diet Plan Is Not Right for You? The most important thing for any diet is to have the right number of calories. To decide that, you should first know what your goal is – dieting to lose weight or dieting to gain weight. If you want to lose weight, you have to eat fewer calories than you burn per day; and if you want to gain weight, then you have to eat more calories than you burn per day. Lose weight: 12 calories X your bodyweight in pounds = number of calories for weight loss, per day. I recommend you check out the bodybuilding diet and nutrition guide for other essential details about basic diet programming information and tips. Reduced carb cravings (for many): By having both carbs and fats in the diet, and not trying to completely cut either out, the individual will experience less craving problems as you’d find with low or no carb diets. Easy to maintain: This style of diet has more flexibility than others will have. It is difficult to stick to diets that require weighing, or completely removing items from your diet, or even meal plans that must be adhered to. Regardless of whether you are out visiting friends, at home, or grabbing a bite during a busy day, the low fat/high carb diet is easy enough to estimate much of the time. Athlete and bodybuilder-friendly: Athletes and bodybuilders have shown far more success on this diet than others. Loads of low GI foods: Low fat diet plans naturally encourages the consumption of low GI (Glycemic Index) and high-fiber foods. Foods with low GI are slow-burning and usually unrefined. These foods take longer to break down and do not spike blood sugar levels. Risk of Dietary Fat Deficiency: If fat intake is too low, there is a risk of health problems all on their own. The body requires a certain amount of fat intake as there are tissues and organs that require fat-specific energy to function. Also, there is a list of vitamins which are only fat soluble and without a minimal amount of fat in the diet, a serious deficiency can quickly arise. Carb Binge (for Some): Although low fat diet plans tend to encourage “healthy” carbs (i.e. high fiber/GI carbs) for many people, there are some who can go the complete opposite way; certain people – more so women (but also some men) – tend to crave carbs, which can be amplified after eating a lot of carbs. These people run a higher risk of going “carb-crazy” by overindulging in refined sugary carbs. “Nice, sugar cubes are fat-free!” says the misinformed dieter: That quote alludes to the fact that this diet can encourage the consumption of something which can easily be misinterpreted. That is, you must understand that all carbohydrates weren’t created equally, so to speak. Even if they have a basic awareness of the diet’s implications, some people may still go overboard with the wrong type of carbs – potentially interfering with their energy levels and micronutrient (i.e. vitamins and minerals) needs. Are you insulin resistant or sensitive? : A serious downfall of this diet plan is that it causes problems for individuals who are insulin resistant. There are many individuals who are insulin resistant and eating a high quantity of carbohydrates is not the best idea. These individuals do much better with low carb diets. “How Do I Find Out?” I’m glad you asked…. Try recalling how you feel when your diet (span of days, weeks or more – not just a single meal) consists of high amount of carbs. If you feel lethargic throughout most of the day and look/feel bloated, then chances are you’re insulin resistant. “Can I Change This?” Your insulin resistance level depends a lot on genetics, although it can be significantly improved through weight training, cardio and good nutrition. What’s your body’s response to a big carb meal? : This question deals with insulin secretion, which plays a role in your energy response to carbs immediately following a meal. If you tend to lose energy after eating a high-carb meal and then become hungry a short while later, then you likely have high insulin secretion levels. So obviously, people with high insulin secretion should avoid high carb, low fat diet plans. Resistance to fat mobilization: This problem can occur if the consumption of carbohydrates is too high and the energy needs are being easily satisfied, but also if there is not enough intake of ketones from fat. Ketones are enzymes that metabolize body fat. There is a careful line which should not be crossed, so it’s important to pay attention to your body’s needs and what you are feeding it. Those best suited for this type of diet are in-season athletes, which include weight lifters who have high activity levels (i.e. just lifting weights doesn’t count). Weight trainees and athletes, especially serious ones, are consuming a huge number of calories a day to maintain their energy and muscle repair needs. Depending on their activity level, body size, and composition, they can need anywhere from 3000 to 7000 or more calories a day! …Even your average individual who does the government-recommended 30 minutes of activity per day, three days a week, does not need to intake any more than 2000 calories to stay healthy, nor do they need the higher quantity of protein that athletes, bodybuilders, or other weight trainees require. …And so, that leaves him with 800 calories left for fats (~89 grams). This is more than a sufficient amount of dietary fat, even though it’s technically considered low fat since 16% – as opposed to 30% – of his calories come from fat (800 cal. / 5000 cal. = 16%). His diet is healthy and effective: he is not deficient in dietary fats, and is oriented towards his performance needs and goals. In addition, as an athlete or experienced lifter, you’ll be more aware of what you are eating, and not make the common mistakes that the average dieter might make in eating the wrong foods, or the right foods but in the wrong proportions. If you are not sure about GI load or the difference between high and low GI foods and what it means, it’s probably best to first get educated on the topic and then decide if it’s something you can follow. Do you think that your body will respond positively to a high carb, low fat diet plan? Do you want to do it, and do you think you’ll be able to stick to the plan? Having answered those above three questions, you may have found out that a low fat diet plan isn’t your best option. And that’s a good thing. You’re much better off realizing that a low fat diet plan (or any other diet) is a dead end before you become invested in it. It is of the utmost importance that your diet plan is realistic enough to follow. In addition, your approach to nutrition should always be aligned with your goals, lifestyle, and body type. Low fat diet plans are poor choices for the majority. Personally, I’ve been on low fat plans in the past, and can attest that you’re lucky to be missing out on some very bland meals! I no longer bother with them because I didn’t notice any major benefits, but I certainly did dread mealtimes. Of course, I’m not representative of everyone, so don’t let my personal experience sway your opinion on low fat diet plans if you’re still considering using it. Assuming you’ve officially decided against the low fat diet plan option, the following information will guide you to finding what is your best approach to nutrition. Carb sensitive: If you’re carb sensitive, then you likely have difficulty controlling your carbohydrate portions; and eating more carbs seems to just amplify your carb cravings. Even if you don’t always crave them, they do seem to make you feel tired or bloated. Now you just have to find the right approach so you can reach your fitness and weight training goals. Elite overachiever: You are an advanced weight trainee or bodybuilder, who is far past the basics. You need a diet that can get you very lean – down into single-digit territory. Or you want to bulk up without putting any noticeable size on; if possible, you would like to gain muscle mass and lose bodyfat at the same time. In the middle: You have no major biases, for or against carbs. Your goal is simply to continue (or begin) progressing with your weight lifting program, reach your fitness goals, and stay healthy. If that sounds most like you, it is safe to say that you fall into this category. Did you pick your best-fit from the above descriptions? Good, now I’ll lay out your options, and recommend your best match. Low carb diets: The opposite of low fat diet plans, low-carb diets are also known as “ketogenic” diets because it encourages the consumption of fats, which is named after the body process ketosis. In short, ketosis involves the formation of ketones (an enzyme) from an increased fat intake. The body uses the ketones to break down the body’s own fat stores. Ketosis occurs when the stored body fat is used for energy, since there is not enough energy produced by carbohydrates. Eating fewer carbs will naturally lead to a higher fat intake, and thus the fat-burning ketosis process begins. Note that you can also use low carb diets when dieting to gain muscle mass. Moderate fat, moderate carb diet plans: Having a moderate portion of fat in a diet is the best way to go. It will help keep you away from cravings and thus minimize binging, which often is what leads to failure. This moderate diet plan can be just as good for cutting as it is for bulking. Flexible dieting: This is my method of choice. I almost consider “flexible dieting” to be a subset of the moderate approach to dieting. However, it’s slightly different in that it allows you to wander outside the bounds of “moderate.” In addition, there’s the aspect of food choice. Flexible dieting is almost an art, but you can become a master in no time. Carb cycling: This is an advanced dieting technique. It is typically used for those who are trying to get down into the single-digits of bodyfat percentage. But it can also be used to gain muscle mass, while minimizing fat gain. There are very meticulously detailed carb cycling programs that have the potential to build muscle while losing fat, although the progress is quite slow. All in all, you can feel free to try any approach if it appeals to you – even if I didn’t list it under the profile that best describes you. …Sure, there are actually some commercial diet programs and books that have proven their effectiveness. But even then, they are usually just a variation or systematized presentation of one of these dieting methods. All the information you should need to build an effective bodybuilding diet plan is on this site. Hopefully this guide helped you find your best approach. Good luck on your diet and happy eating!